I've been searching for small dog bows!!! 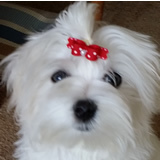 I just knew Petco or Petsmart would carry small dog bows! At LEAST small rubber bands...but no. I decided to search on the Internet and BowBiz Dog Bows came up. I could not believe all the products NOT to mention the how to videos! I even bought my male,Tarek,black rubber bands to keep his hair pulled up! Tiffany looks cuter than ever! I will be a repeat customer for sure! How can I not be at these very reasonable prices?! I would like to thank you for your beautiful work and dedication. I am very pleased with my order and the perfection into every bow. Your work is well appreciated and I will be ordering from you again once a few of your items are back in stock. Thank you so very much for your talent my baby Kami and I love it! I just love them the quality on such small bows I have never seen before.. I will be ordering again.. I just wanted to let you know how much we enjoy, and love your bows. The quality is unmatched, they are bright, well made and received in the mail quickly. Thank you so much for all your hard work. Have a wonderful holiday! Wanted to send you a picture of my little Shih-Tzu Cameo. She will be popular around the neighborhood with all theses lovely bows. 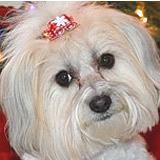 I absolutely LOVE your dog bows for my Havanese Willow! Your bows are quality made and lightweight enough not to bother her. I also appreciate how you allow choosing the different attachments for securing the bows in dogs hair. I prefer the plastic barrettes because that's what stays the most securely in her hair. I also appreciate the thoughtful free gift! 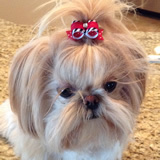 I've attached some photos of my Willow wearing the Christmas barrette I ordered. Hi! It's Molly here ... I want to thank Susan for all my beautiful bows from BowBiz. They look so adorable on me and I can't wait to order more. Keep up the good work, Susan! Hello from Gemma and I. 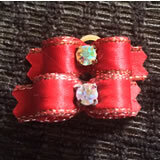 We wanted to share how pretty the tiny bows are for pigtails or small ponytails. I also wanted to comment about the quality again. They are just fantastic. We haven't used them all yet, but we're working on it before our second order arrives! Thank you for excellent service and a great product. We are truly pleased. Very Happy Tzu Mommy of 2! I heard about BowBiz from a friend (Patrica) and fellow Tzu Mommy. When I first clicked the link to your website I thought this is too amazing to be true. So many options , styles, colors, sizes and more. I was in now heaven. I knew I would not be able to pick just one. Placing my order was simple. Account set up and payment was very user friendly. I received my order yesterday and was so pleased! Shipping was fast, the packaging was great and the Bows... OH THE BOWS! So cute I just wanted to try them all on the girls! Quality and durability is great!! The sizing was perfect as well. I really couldn't be happier. Thank you! I'm fairly sure I am addicted and this will be where I purchase bows for my girls from here on out. Great experience, customer service and product. Sadly it's a rare thing these days so when it happens I make sure to give credit where credit is due! BowBiz is the BEST! I have shared your link on my Shih Tzus fan page as well as on other group pages when everyone asked "OMG where did you get their Bows"! I wanted to stop by and tell you a story about the great quality bow you sell! I had Ruby and Rosie wearing a tiny red bow I bought from you last fall right before the snow came in in a Northern Minnesota. Of course one of the girls lost their bow..my fault as I didn't put it in very tight! I couldn't find it. However, this spring right at meltdown, my boyfriend noticed the glitter from the rhinestone and saw the red bow in the snow! Check it out...at least November-April outside in the elements...and it's still stiff as a board!!!! Slight difference in color is due to lighting NOT the bow!!! A friend recommended your bows to me (Tammy Jo) and I'm so glad she did. The colors are vivid and quality is fabulous. We appreciate the included free bow & bands that we received, what a pleasant surprise! The packaging was great, everything came as expected. We've only used this one so far, but cannot wait to try the others. It stayed in nice & tight and even while running outside & playing it held well. I'm so thrilled & can see future orders from your site. Just received the bows I ordered and was so excited and amazed at the quality and with the speed which they were sent. I also appreciate the free bonus bows. They are all exceptional! I am going to order more right away. We received your beautiful bows last week and we loved them all. Chinnie looks so adorable with them. We'll definitely come back for more. Thanks again for making such wonderful bows. Please forgive me for such a late response. I've been meaning to tell you: I LOVE THESE BOWS! These are beautifully constructed, dogaliciously chic, and bowdorable! I read testimonials from your other customers and it's all SOO true and fabulous! Thank you again for the custom brown bow with the 'alligator clip' attachment. That was so thoughtful and furthermore helped me choose the right clip for this little girl. With my 'wannabe bowlicious hair tying techniques' I've found that the 'French barrette' is the best clip for Miss. Suki. It does not fall out, and she doesn't want to eat it. Thank heavens, thank you also for the great advice in choosing the French barrette! I've included the 'bow' progress pictures of Suki. Now I've decided its time for some more bows, colors, and patterns! I am looking at some cotton pajamas and in dire need of bows to match the prints. Which means it's time to 'bowbiz dog bows' shop!